Summer is a celebration of all that is tropical and good in this world. Mangoes, lychees, avocado, mamey, anones, and star fruit galore- this is what my summer is made of. Summer in South Florida is filled with ripe mangoes and everyone you know either has a mango tree or a friend or relative with a mango tree. The air around homes with mango trees is sweet with ripe and rotting fruit baking in the hot Florida sun as many don’t pick or enjoy the fresh mangoes fast enough and they fall to the ground fermenting. When I lived in Coral Gables I would walk my dog Chloe and mangoes would literally fall at my feet from neighboring trees. Coral Gables is a tropical paradise with limestone houses, shady banyan canopies and palm lined streets. In the summer the tree lines are often dotted with red ripe mangoes and bright lychees ready to fall at a moment’s notice. You might even catch a Macaw on the branches or a tall white Egret on your street corner. This recipe is the cousin of the classic Cuban avocado salad with the addition of fruit. Cuban mango avocado salad is a simple summer recipe that uses the freshest of seasonal ingredients and lets the ripe fruit shine. 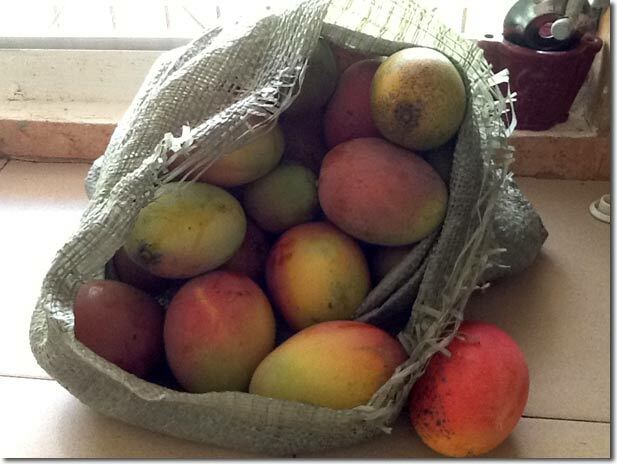 The scent of ripe mango will always remind me of South Florida summers and riding home with Publix bags filled with this tropical delicacy from family and friends fortunate enough to have a mango tree of their own! This summer Cuban mango and avocado salad is perfect for grills, picnics, large parties, and quick and easy meals. Soak the sliced red onions in cold ice water. Soak for 20 minutes and then drain. The thin film on the red onion will naturally separate and becomes easy to peel right off like in the picture below. Next add the red wine vinegar, sugar, and juniper berries (optional), and make sure to top with water to cover. Let the red onions marinate for at least 30 minutes covered in the fridge. Dice the mango and quarter the tomatoes. Add diced avocado* and top the salad with salt and freshly ground black pepper. Add the marinated red onions to your taste. Drizzle the mango avocado salad with the olive oil and a squeeze of lemon. Gently mix and enjoy! Try this recipe with roasted chicken, anything off the grill, fresh fish, really anything you like and make sure to enjoy the summer produce while it lasts. **Note: I used Haas avocados in this recipe, but the crisper watery Florida avocado is my favorite here. Sadly I could not find them in New York, so the creamy Haas will have to suffice. I’m a holiday traditionalist. Each year I look forward to the tried-and-true dishes, seasonal favorites, and family specialties. While I love thumbing the pages of cookbooks and pinning new holiday sides, I always go back to the classics. One of these classics is my abuela’s Cuban stuffing (relleno) that everyone craves around this time of year. Scribbled on the back page of my mom’s beloved Cocina Criolla cookbook is my abuela’s recipe that she makes each year for the holidays, especially thanksgiving. I have to admit I’m a sucker for the bready and soft American version with plenty of butter, celery, and onion, but my abuela’s Cuban stuffing is a thanksgiving and holiday favorite. The mixture of beef, pork, and ham with warm cumin, plump raisins, crunchy almonds, and Spanish olives makes Cuban stuffing a blend of deliciousness with familiar flavors and comforting aromas. My mom makes the stuffing each year for Thanksgiving, but I think it would be great stuffed in small cornish hens for fancy dinners, baked in pastry, or just by the bowlful atop white rice. I made this Cuban stuffing for the first time ever with my mom this year. The stuffing was easier to make than I imagined, and oh so flavorful. As the years go by, my appreciation for my family’s traditions and favorite dishes has only increased, and I’m happy I get to document them and share with younger cousins, baby brothers and sisters, and future generations. Dice the garlic and onions; grind the diced ham. I have made the mistake of purchasing smoked, honey, or mesquite diced ham. 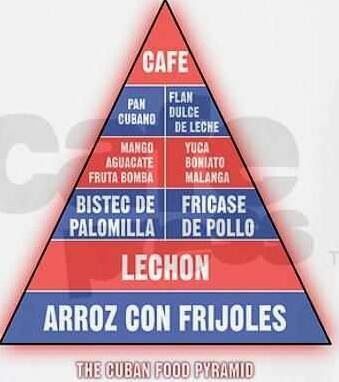 This totally kills the flavor of the relleno and does not work. I grind the diced ham in the food processor. Add the pork, beef, onion, and garlic to the pan all at the same time. Stir well and cook until just browned. Make sure to buy ground chuck or sirloin and avoid leaner cuts of beef. You do not want to overcook the beef because it will continue cooking in the bird if you choose to stuff it, or it will heat in a crockpot for serving, and do not drain the fat. Once browned add all of the herbs and spices and mix well. Do not add salt. Both the ground ham and the olives add plenty of natural sodium. Trust me on this!! Next add the package of cornbread stuffing and combine thoroughly. At this point you can finally add the ham stirring to combine, and then go ahead and toss in the almonds, olives, and raisins. You can always add more to taste (of everything) and this part is really up to you- that’s the fun part of cooking and tasting =P. The raisin, almond, and olive trio really does add lots of flavor and is reminiscent of delicious picadillo. If you are making the Cuban stuffing a day in advance allow the dish to cool before placing it in the refrigerator. If you stuff the bird with the Cuban stuffing it does not require any stock to keep moist, but when you are reheating for a thanksgiving or holiday meal, you will want to slowly add hot stock of your choice and blend well. If the Cuban stuffing becomes too wet simply add more of the cornbread stuffing. I always buy two bags just in case. This year we placed the Cuban stuffing in a crockpot on low to warm a few hours before everyone came over and it was perfect and delicious. I’d say this version makes around 16-18 cups. Cuban stuffing is surely to become a holiday staple and thanksgiving must. Platanos maduros are caramelized and crispy on the outside with soft, sweet, and gooey centers. Plantains, a tropical starchy member of the banana family, can be enjoyed sweet or savory. Platanos maduros which translates to ripe plantains are made from totally tender black plantains. In their very ripe and green form, plantains yield savory and crunchy treats with a hint of sweetness called mariquitas (plantain chips) or tostones. Very ripe plantains yield a sweet delicacy called platanos maduros (sweet fried plantains) that caramelize in the hot frying pan and melt in your mouth. I like to let my platanos maduros get extra crispy and nearly burnt. These tiny pieces of crunchy delights almost melt away like sweet chicarrones when done right. Platanos maduros are a celebrated dietary staple and can pretty much accompany any Cuban meal especially picadillo. While tostones might be a reigning favorite, platanos maduros offer a balancing sweetness to rich and salty Cuban dishes. Heat the oil. I placed the heat between 5-6- make sure you wait until the oil is hot. You usually want to use about an inch of oil or so. I like to use less oil or sometimes I quickly sear the outsides of the plantains and then bake them at 350 for 20 minutes with a sprinkle of brown sugar to be somewhat healthier. When the oil is hot fry the sliced sweet plantains on both sides until a golden deep rich brown color with crispy edges emerges. Place the plantanos maduros on paper towels to drain off the excess oil when finished. Obviously they taste majestic and glorious when sitting in the oil but for my arteries’ sake I drain them. I like to sprinkle a little salt on the paper towel so they don’t stick and so the salt melts into these sweet treats. The platanos maduros will be initially quite hot with crispy gooey exteriors but lava-like centers. Once they do not cling to the paper towel, I know they are ready to eat. Gently use a spoon to see if they will give enough to pull without tearing. Lime is not necessarily a traditional addition, but usually when you eat platanos maduros with picadillo or palomilla the lime used will get on them and taste amazing. A little squeeze of lime only amplifies their flavor.